This hat is complete art and we could not keep out eyes off of it! Although we could never see someone walking down the street in this hat, we do believe that this artistic expression will be an amazing conversation piece for home décor or at an art museum. We enjoy the décor of a yellow gold necklace with diamonds, sapphires, citrine garnets and quartzes. The hat also features a silver and golden stainless steel necklace with leather and Swarovski crystals, Alviero Martini Jewelry, and even a Rosary in rhodium-plated silver with pearls and blue sapphires. What do you think of this hat? Would you wear? 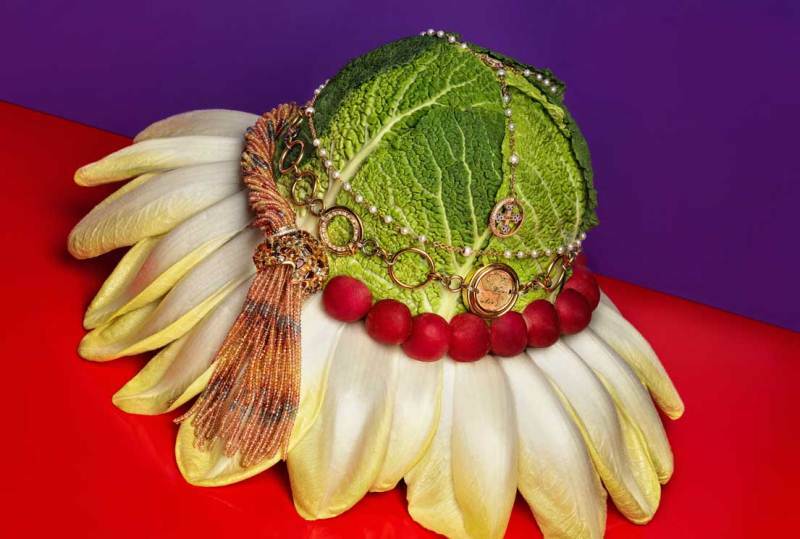 This entry was posted in PearlsOnly Blog and tagged hat, Natural Veggie Flower Hat, Pearl and Jewel Decor, Pearl Fashion, style by PearlsOnly Team. Bookmark the permalink.